You’ve been planning your annual family vacation for months, and it’s time to get the show on the road! 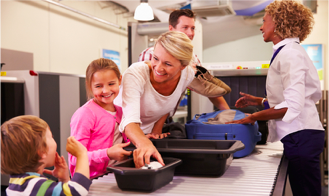 Here are some tips to help your airport and flight experience be hassle-free. Always leave extra early. You don’t want to have to be rushing through security with 4 rowdy children and risk missing your flight! 2. Take pictures of EVERYTHING. Utilize the age of handheld computers, and keep photos of things like the location of your vehicle in the airport parking lot, or posters of local taxis when landing at your destination. Your iPhone camera isn’t just for Snapchatting your friends, use it as a helpful tool while on vacation. Empty pockets before getting in line! TSA allows carry-ons for a reason, use them wisely. Your kids may want to be on their Nintendos, but trust me, putting the games away early on will save you the extra hassle later in line. Find the family lane! 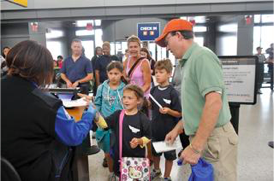 The TSA agents are there for the kids, ready to help you out. They make going through security that much easier and faster, and even have stickers for the kids at the end! 4. You’re through security, but now to find the gate. If you’re traveling with multiple little ones, they are bound to get squirmy by this point, especially after waiting in that long line. Color coordinating their outfits and luggage can easily help you keep track of them in the crowded airport. 5. 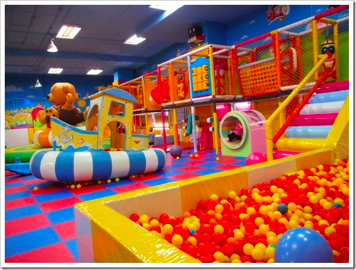 If you have a little extra time, finding the airports play space can help your kids burn off some steam before the flight. Letting them run around for 20 minutes could turn into 20 minute of quiet naptime during the flight! 6. Before reaching your gate, make sure EVERYONE uses the bathroom. You’ll be thanking yourself later when your husband is sleeping and all your young ones want to use the bathroom at the same time. 7. 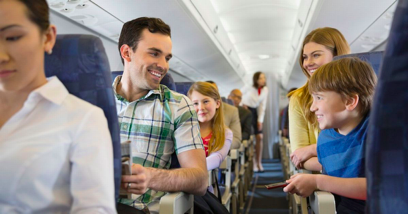 When getting on (or off) the plane, Mommy or Daddy should be in front and in back, with the youngsters single-file in the middle, to ensure everyone is boarding on the right track. Baby wipes, for the messes. Gum, otherwise the kids will be screaming the second the plane takes off! Entertainment! Nintendo’s, coloring books, cards, LEGO’s, etc. Sweaters, or even a blanket — the plane’s thermostat is ALWAYS unpredictable. 9. You’re off the plane and at the baggage claim. Keep the kids occupied by making a game out of finding your luggage! Whoever finds your suitcase gets a prize later! You’re now ready to get to your hotel! You have found and taken a picture of the list of local taxi services or ordered yourself an Uber or Lyft, and are anxiously waiting to get your vacation started. Hopefully this list helped you get through your flight with the fam, and don’t forget to utilize it on you flight back home!